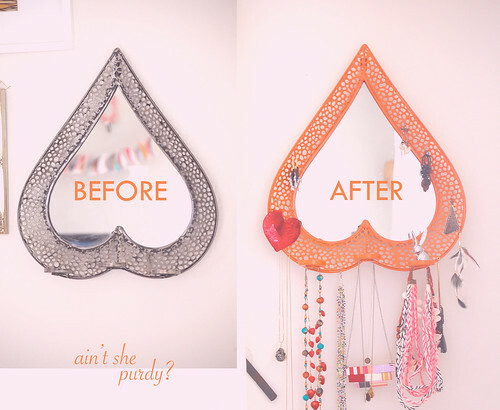 So, I've sort of been sleeping on this DIY project for awhile now...I bought this upside-down heart mirror about a year ago at Ross and only got around to spray painting it last weekend. I discovered that the holes were perfect necklaces and earrings so now it's more like a jewelry display. Rather then storing your Jewelry in a box or in a drawer, outwardly displaying your jewelry is such a cute way to put more color and sparkle in your life don't you think?